Newly renovated garden suite with contemporary open concept living space, modern colours and comfortable furnishing. The suite was professionally designed and with its high ceilings, warm laminate flooring, fabulous kitchen and lovely gas fireplace it feels like upscale living. The large kitchen has everything you will need for a pleasant stay and has a gorgeous large island with seating for four. There is a gas stove, microwave, coffee maker, large fridge with bottom mount freezer, trendy tile work and modern lighting. The living room has a wonderful L-shaped leather sofa which would be nice to relax on to watch TV in front of the gas fireplace. The decorative barn doors to the good size bedroom can be left open to make the suite feel more spacious or closed if desired. The bathroom has a unique sink, frameless walk in shower with rain shower head. There is storage for towels and a medicine cabinet over the toilet to store your belongings. 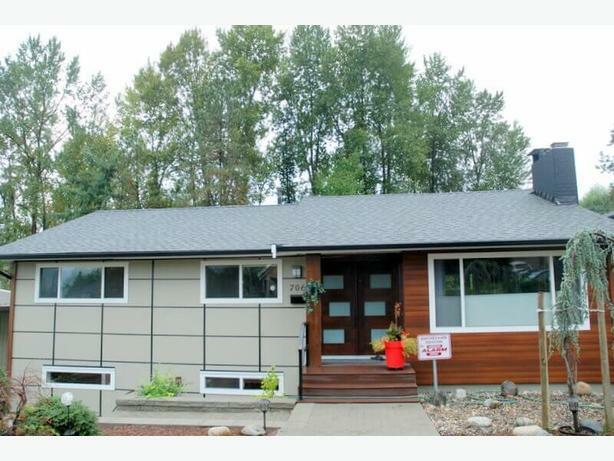 Located in the Glenbrook area of New Westminster just minutes away from Queens Park. Close to Royal Square Mall and several coffee shops and restaurants. Only ½ block from the Canada Games Pool & Fitness Centre, Community Centre and Curling Club. Conveniently located on bus route which takes you to the New Westminster Sky train station. Close to Royal Columbia Hospital and just a 5-minute walk to the Justice Institute of B.C.